Deemed the most prestigious awards ceremony in the traditional music calendar, sixteen awards will be presented to the best Scottish trad talent at the MG ALBA Scots Trad Music Awards in a televised ceremony on the 3rd December, and amongst them will be a nomination with a Manx connection. 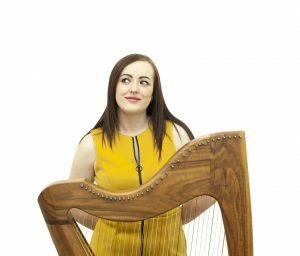 Harpist Rachel Hair, who is based in Glasgow, visits the Isle of Man each month to teach the Celtic harp using Manx traditional music through lessons organised by Culture Vannin, and has been nominated in the category of Music Tutor of the Year. Rachel has been in this role since 2011 and currently has more than twenty students from all parts of the Island. A number of them are members of Rachel’s Manx harp ensemble Claasagh, performing at community events throughout the year. Their next appear will be in the Rotary Top Talent Concert at the Gaiety Theatre in Douglas on the 26 November. Additionally, Rachel Hair has produced two books of Manx music arrangements for the harp entitled Claasagh 1 & 2, which have been taken up by Celtic harpists around the world. She has also included several Manx melodies on her solo albums, and composed a harp ensemble suite in celebration of the life and work of Manx born artist Archibald Knox. Meanwhile the name of any child on the Isle of Man with an interest in learning to play the harp can be added to the waiting list by contacting the Manx music Development Officer, Dr Chloë Woolley at manxmusic@culturevannin.im or by telephoning 01624 694758.